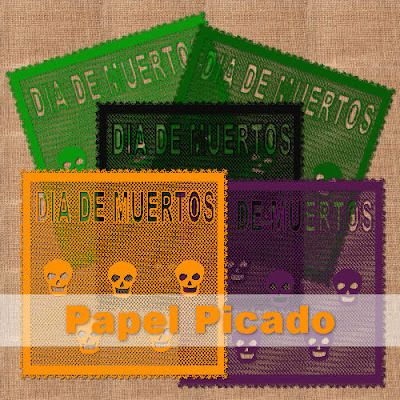 Si algo caracteriza al pueblo de México son sus artesanías, entre ellas el papel picado representando motivos mortuorios para adornar los altares. Aquí te entrego unos muy sencillos para adornar tus scraps, tiene medida de 5"x5" - 300 dpi. Bájala pinchando sobre la imagen. Thank you so much for this post. I want to let you know that I posted a link to your blog in CBH Digital Scrapbooking Freebies, under the Page 7 post on Nov. 05, 2010. Thanks again. Thank you so much for this post. I want to let you know that I posted a link to your blog in CBH Digital Scrapbooking Freebies, under the Elements or Papers post on Nov. 07, 2010. Thanks again.